The partnership provides up to date information on the latest funding opportunities for the transport sector, helps boroughs to develop project proposals and contact international partners. Occasionally, LEPT will take on the leading role in projects with a pan-London character. Below you will find the past projects coordinated by LEPT (PTP-Cycle and STARS) and also previous projects with which LEPT have been involved and links to their external websites. ASTUTE was a three year project, from 2005 - 2008, funded by the Intelligent Energy for Europe's (IEE) STEER Programme. Its aim is to increase the number of walking and cycling journeys in Urban Areas. ASTUTE identified the barriers which public and private sector organisations face in promoting walking and cycling, and produced an online toolkit comprises many best practice examples which will help you overcome these barriers. Please contact a member of the LEPT team for more information. COMMERCE was a three year project, part of the Intelligent Energy for Europe's (IEE) STEER Programme. It increased the number and quality of Mobility Plans developed by small and medium sized companies by providing tools and standards based on best practice across Europe. Mobility Plans are also known as Travel Plans and their development is a clear way of reducing commuter's CO2 emissions. EPOMM-PLUS was a three year project running from 2009 - 2012, funding by the Intelligent Energy for Europe's (IEE) STEER Programme. It aimed to achieve a quantum leap in the use of mobility management in Europe. It establishes EPOMM (the European Platform On Mobility Management) as the authority and the networking instrument for the promotion of mobility management in the EU, thus strengthening EU cooperation and dissemination in this field. PIMMS was a 3 year project from 2005 - 2008, funded by the Interreg IIIC Programme. It was a network operation focussed on the exchange of best practice information (a) between the partners and (b) between them and their regional partners. Its objective was to achieve change by empowering regional decision-makers to extend the use of mobility management. PIMMS TRANSFER was a three year project, running from 2008 to 2011. The project was funded under the European Union's INTERREG IVC programme, which promotes the exchange of good practices between regions. The project raised mobility management up the agenda in the partner cities through tailored programmes of exchanges, training and awareness-raising activities. PTP-Cycle was a LEPT-coordinated project that used Personalised Travel Planning (PTP) methods to promote a shift from private motor vehicle use towards cycling, walking and public transport. As the term suggests, PTP provided tailored information directly to the individual on sustainable mobility options through a one to one discussion with a PTP Adviser. An information pack based on the needs of the individual was then hand-delivered, leading to a greater propensity for behaviour change than a one-size-fits-all-approach. Five cities have come together in PTP-Cycle - supported by LEPT, Polis, Traject, and Sustrans - to develop the first pan-European PTP Delivery Programme, transferring their know-how to a larger audience of European cities. 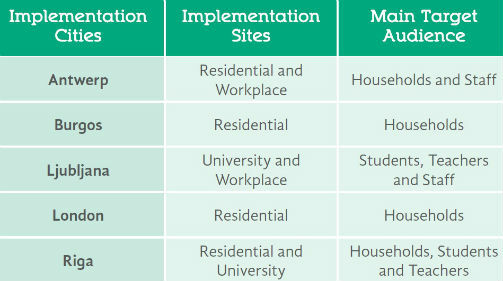 Using the approach of segmentation, each implementation site has identified specific target groups with the largest potential for behaviour change. The trained PTP travel advisers engaged the audience, asking particular questions to highlight which alternatives might lead to a shift in behaviour. The resulting Personalised Travel Plan packs might have included discounts on bikes from local shops, cycling training sessions, local travel information materials and other services provided by the city or public transport operators in the target area. PTP-Cycle offered a holistic approach to assist cities, businesses and universities in developing their PTP processes. Training Programme: Implementation cities trained by PTP expert Sustrans and build local delivery teams. PTP Training Programme Manual: Handbooks developed and translated to assist PTP adopting cities. Local Knowledge Hubs: Field offices give a permanent presence and resource across the residential areas, workplaces and university campuses. 50 PTP Champions recruited: Volunteers deliver supporting events, campaigns and competitions in their communities. PTP-Cycle demonstrates that PTP activities can be transferred and adopted by diverse implementation sites and target groups, and lead to increased levels of cycling and walking in cities, as well as public transport use and car-sharing. In so doing we are supporting cities in their pursuit of reduced congestion, cleaner air, healthier citizens and reduced CO2 levels. Visit the PTP-Cycle project website for further details. Request the free PTP Training Programme Manual to allow you to deliver your own PTP Programme, tailoring it to your local needs. Please contact a member of the LEPT team if you have any questions about PTP-Cycle.